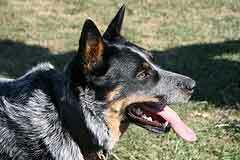 Many dogs tend to be known by alternate names and the Australian Cattle Dog is no exception. This beautiful breed of animal is also known widely as the popular Queensland Heeler, Red Healer and Blue Heeler. This Australian breed is especially adapted for herding cattle. Although it is a dog of only medium size it is very intelligent, energetic and task orientated. Most people can readily recognize these animals by what is known as the mask. The mask is distinctive for the Australian Cattle Dog and is a blue-black color patch that covers either one or both of the animal’s eyes. If this trait appears on both eyes the dog is known as either a single mask or a double mask. If the animal should have no mask at all it is simply referred to as plain faced. At birth the cattle dogs are pure white and tend to get darker as they age. These cattle dogs generally measure approximately 17 to 20 inches tall and is well muscled with a dense coat. These Australian dogs are available in a color combination that includes shades of blue or of red mixed into the normal coloration of white and grey although blue is usually the more dominant color of the species. When selecting one of these canines for breeding or even as a pet the potential owner is always on the lookout to avoid any overweight or excessively heavy animals as this would hinder its agility greatly. A well conditioned animal is absolutely necessary in order for this breed to accomplish its daily tasks of herding cattle. For any owner who may be considering entering their canines into a dog show the markings should be even and consistent. Uneven markings are considered in poor taste for dog show competition. Ranchers on the other hand are more concerned with the animal’s abilities for herding cattle. Their intelligence and work ethics are their top concern. Since these dogs are working animals they tend to be very active therefore they require a considerable amount of exercise and must be kept busy at their job. If the dog is kept for other then working reasons it should still be maintained in an active environment possibly performing tricks or other types of activities which tend to keep it busy and actively thinking. One mistake that most owners make with these animals is they fail to provide them with activities to keep them occupied. In such situations the dog itself will find things to do but unfortunately most are of a destructive nature.